President Donald Trump is pulling the plug on a nuclear arms treaty with Russia, accusing Moscow of violating the 1987 Intermediate-Range Nuclear Forces treaty with "impunity" by deploying banned missiles. Moscow denies it is in violation and has accused Washington of resisting its efforts to resolve the dispute. The Trump decision reflects his administration's view that the arms treaty was an unacceptable obstacle to more forcefully confronting not only Russia but also China. The move announced Friday sets the stage for delicate talks with U.S. allies over potential new American missile deployments. Russian politicians are blaming the United States for what they say is the undermining of global security by ending compliance with a nuclear arms treaty. But NATO says Russia is at fault for the demise of the Intermediate-Range Nuclear Forces treaty. The U.S. says it will stop observing the treaty as of Saturday and withdraw within six months came after years of dispute between Moscow and Washington. Each claims the other is in violation. In particular, the U.S. says a new Russian missile breached the treaty. But Russia accuses the United States of unilaterally seeking to neuter the treaty and of resisting Russian attempts to resolve the dispute. The head of the foreign affairs committee in the upper house of Russia's parliament says the U.S. "has taken another step toward its destruction today." The end of the treaty could serve Russia's strategic interests by removing any obstacle to deploying intermediate-range missiles that could reach Europe and China. NATO says Russia is in breach of a key Cold War-era nuclear treaty, and the Western military alliance is urging Moscow to come back into compliance during the six months that remain before the United States abandons the pact. The U.S. says it will suspend its obligations to the treaty on Saturday, and that if Russia doesn't come into compliance, the Intermediate-Range Nuclear Forces treaty "will terminate." Minutes after the U.S. announcement, NATO nations urged "Russia to use the remaining six months to return to full and verifiable compliance to preserve the INF Treaty." NATO members say the military alliance will continue to review the security implications of Russian missile development. They say NATO will take any "steps necessary to ensure the credibility and effectiveness of the Alliance's overall deterrence and defense posture." NATO says that if Moscow fails to destroy all new missile systems that Washington insists violate the treaty, "Russia will bear sole responsibility for the end of the treaty." Secretary of State Mike Pompeo has announced that the U.S. is pulling out of a treaty with Russia that's been a centerpiece of arms control since the Cold War. The American withdrawal had been expected for months. It follows years of unresolved dispute over Russian compliance with the 1987 pact, which bans certain ground-launched cruise missiles. Russia denies violating the treaty. 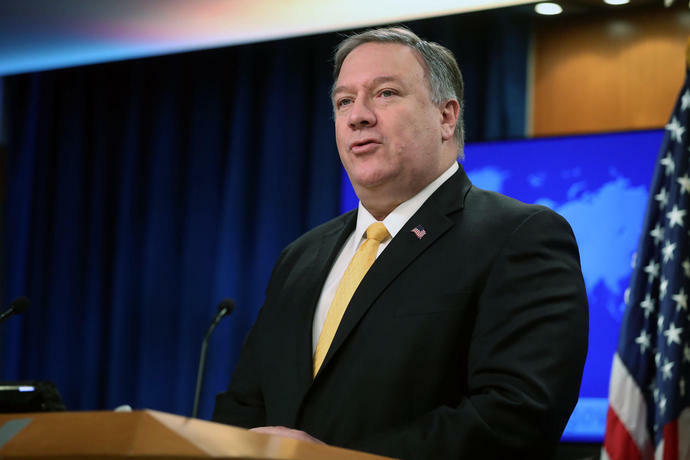 Pompeo says the U.S. will suspend its obligations to the treaty on Saturday. Pompeo says that if Russia doesn't come into compliance, the treaty "will terminate." It's a U.S.-Russia treaty that's been a centerpiece of superpower arms control since the Cold War. And its demise has some analysts worried about a new arms race. An American withdrawal has been expected for months, and an announcement is expected later Friday. It would follow years of unresolved dispute over Russian compliance with the pact, known as the Intermediate-Range Nuclear Forces, or INF, treaty. It was the first arms control measure to ban an entire class of weapons: ground-launched cruise missiles with a range between 500 kilometers (310 miles) and 5,000 kilometers (3,100 miles). Russia denies that it has been in violation.